Today and yesterday I tackled my Gmail inbox: at least 6600 messages from the past eight years. Most mornings when I wake up, I am met by four to ten mass emails. Most of them are from mailing lists, scheduled to be sent at midnight somewhere in the world. These are things that I've signed up for, that I want to be aware of (programming news, social network digests), but that I don't need with any sort of urgency. I can skim through in batches once every week or so without missing anything. So I set up filters to review them at my leisure. A vast majority of the work entailed purging old mailing lists, followed by labeling and archiving emails with "Friends" or "Family", "School" or "Jobs", among others. My taxonomy evolved as I sorted, and eventually I was left with a solid core of emails that were more difficult to categorize. Some of them prompted new labels (or the broader application of an existing label), while others simply didn't belong in Gmail. The most numerous of these were assorted messages to myself. I moved a few links to Evernote. I typed up a scan of a passage from a book that I liked. I merged a couple college essays into my school archive directory. All but three emails have been either archived or deleted. Success! This year, instead of buying each other Christmas presents, Sarah and I decided to plan a trip to Vancouver. We found a Groupon for a nice hotel, and bought round-trip train tickets, and the night before leaving, we packed. The train up was lovely. 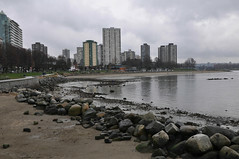 It was an overcast morning, with all manner of birds out the window: ducks, seagulls and crows, and a few bald eagles. The ducks were my favorite. You'd see a solitary duck sitting serenely on the waters, and then, like magic, it would be a pair of ducks. When they dove there was some warning, the flip of a tail and a flash of feet, followed by a slight ripple; but when they returned it was as if they rose like sudden bubbles from deep underwater. Each time it happened I had to laugh. Soon I was trying to watch all the ducks at once to see them re-emerge — a losing proposition. Altogether it was quite a pleasant ride, with islands across the water and mountains in the distance. When we got to Vancouver we went to The Chinese Tea Shop, which sells excellent Chinese teas. Daniel, the proprietor, had us try a few: a Liuan tea, a raw puerh from 2005, and a 20-year aged roasted tieguanyin. The tieguanyin was fantastic, and had considerable life to it, so we bought a couple ounces. We also bought some Liuan, since it was new to us and we wanted to share some with our tea friends. I have decided that I need to start my own personal tea glossary to define the various tea terms that I come across. That way, if I mention something that might be unfamiliar, I can just link to my own definition of the term. 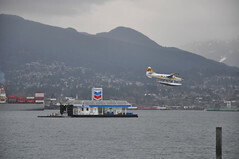 My favorite new experiences from this trip were wandering through Gastown, a charming district of small shops and restaurants; taking pictures of the float planes taking off and landing, the floating Chevron station and the mountains behind them; and seeing a little bit of Stanley Park, the enormous park in the Northwest end of the downtown peninsula. Here is a rundown of our food experience in Vancouver. On Friday we got Dim Sum at Jade Dynasty, a place we discovered on our honeymoon. It was good, though their Xiao Long Bao wasn't as contained as it should have been. That night we ate at the Alibi Room, a great little pub/bistro in Gastown. Both mornings we got croissants (and other delicacies) from Cho Pain, a French bakery near our hotel. On Saturday we took a train ride down to Richmond to have a late lunch at Kirin, which we'd heard was better than their location in downtown Vancouver, but from what we ordered it seemed pretty comparable (the pot stickers weren't quite as amazing, but the Chinese broccoli was perfection). Richmond itself was suburban and a bit bland, crammed with malls both large and small. That night, after wandering around looking at various possibilities, we ate at Hapa Izakaya. An izakaya is a Japanese-style bar with lots of small plates; the West End is simply packed with them. Afterwards we went to Market for dessert. We were a tad underdressed, but the crackling key lime pie was amazing. Crackling in this case means sprinkling pop rocks on top, which makes for an interesting experience if you're not expecting it. The next day, on our meandering way to Stanley Park, we ate lunch at Kingyo Izakaya — their special bento is excellent. I didn't recognize half of the items, but I enjoyed all of them. We resolved next trip to spend less time at restaurants. You are currently browsing the out of the blue weblog archives for February, 2012.